Learn what pioneering building managers and owners are doing to make recycling and reuse and organics collection convenient, easy, and part of the social norm, while tapping into Ottman’s insights into how to customize these strategies to the needs and culture of your own building. Read: Are NYC’s Buildings Ready to Rev Up Recycling? How to align brands with zero waste thoroughly and credibly, while avoiding the pitfalls of greenwashing. Learn: what does ‘Zero Waste’ mean to consumers and other stakeholders?, How to make credible ‘zero waste’ claims, How to certify Zero Waste via third parties, and How to credibly demonstrate your organizational commitment to Zero Waste to all stakeholders. Get Jacquie’s insights about green marketing HERE. NYC’s Bumpy Journey to Zero Waste June 2018: What Comes After Shopping? What an engaging speaker! Such great ideas about opportunities to reduce more in our buildings and neighborhood. I was so impressed by your amazing ability to inspire the audience with your enthusiasm and expertise! Presentations like yours are essential to helping bring sustainability understanding to the next level. 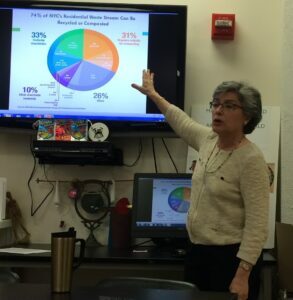 Jacquie’s ‘WasteLess, LiveBetter‘ talk and workshop…was a great summary of the Zero Waste 2030 program in NYC. Now I feel more knowledgeable about how to do my part towards achieving a zero waste goal. Who knew there were so many easy ways to participate? Jacquie Ottman is one great speaker – so knowledgeable, inspiring, witty, and friendly. I appreciated the way you she got people to introduce themselves and interact… I have been much more conscious since her talk. During her talk about Wasting Less and Living Better, I got the idea to host a casual open house for the neighbors on my floor. I want us to be more of a community!